Thanks to Jaime Puente for recording this. It felt really special getting this opportunity to sing with my daughter, the REAL singer, at the Save Texas Schools rally this past Saturday. Thanks to Allen Weeks, Alfredo Santos, and the STS crew for all your hard work in putting this march and rally together. I hear that between 10-11,000 folks attended. Great job! AUSTIN - Texas lawmakers may not be united on upping public school funding, but a flurry of recently filed bills shows they have heard pleas from parents and educators to reduce testing and ease graduation requirements. In a sign that lawmakers are listening, senators on Wednesday passed their first bill of the session, to end the mandate that students' grades be tied to their scores on state exams. On the same day, the leader of the House Public Education Committee filed an omnibus bill with bipartisan support that would reduce high-stakes testing and give students more options for coursework. Parents and superintendents say they are optimistic about changes this year, while some business leaders worry the state will continue to produce graduates unprepared for college or the workforce. "We are definitely being heard," said Susan Kellner, an organizer of Texans Advocating for Meaningful Student Assessment, a parent group that supports less testing. The group's first victory came Wednesday when the Senate voted to eliminate the rule that state exams count for 15 percent of high school students' final grades. The House is likely to follow suit, with similar bills already filed and Gov. Rick Perry expressing support for leaving the grading decision up to local school districts. The omnibus bill filed Wednesday by the House's education leader, Rep. Jimmie Don Aycock, would end the grading mandate, as well as cut the number of mandatory high school exams from 15 to five. The widely feared algebra II exam would be optional, and students could take a greater variety of courses to meet graduation requirements. The bill also would end a three-tiered diploma system that prevents students on the easiest plan from entering four-year universities. "I think it is a major step in the right direction with regard to testing and accountability," Brian Woods, superintendent of the Northside school district in San Antonio, said of Aycock's bill. The proposed changes come just a year after Texas launched its new, harder testing system, approved by lawmakers several years ago. Results show that 35 percent of this year's sophomores still have not passed at least one of the exams, putting them off track for graduation. "I think lawmakers are listening," said H.D. Chambers, superintendent of the Alief school district in Houston. "I think the moms have obviously gotten their attention because those are the people whose children's education are at stake." Chambers said he can support five end-of-course exams, though he prefers three - in reading, writing and algebra I. "I do not believe that every student in the state of Texas needs to demonstrate mastery of algebra II," he said. Chambers said he is particularly pleased that bills in the House and Senate would give students more course options rather than having to follow a prescribed plan of four years of traditional math and science classes. Students instead could graduate with "endorsements" in areas such as business, arts and humanities, or public service careers. Business groups, however, are worrying aloud that state lawmakers may lower expectations for students. For example, the new House bill would require students to pass a test in sophomore English to graduate, instead of the tougher 11th-grade class. "The way to improve college readiness is not to reduce expectations," said Drew Scheberle, a senior vice president at the Austin Chamber of Commerce. Texas Education Commissioner Michael Williams, a Perry appointee, likewise has urged lawmakers not to retreat from school accountability, noting that elementary and middle school students did well on the first round of the new tests last spring. While lawmakers seem to agree generally that high school graduation requirements need to be more flexible, they are far from consensus on specifics. "The details of that will make the next 110 days interesting," said Ellen Williams, an Austin lobbyist who specializes in education. Last spring, Texas ninth graders took the STAAR end-of-course exams for the first time. Using results from Pearson Education, the state's testing contractor, this interactive provides the first look at how the state's school districts performed. Because the data has not yet been released by Pearson Education, these results do not include summer end-of-course retakes, and only represent the tests taken in the spring. Students rated "Unsatisfactory" – also known as Level I – are considered "inadequately prepared for the next grade or course." Students rated "Satisfactory" – also known as Level II – are considered "sufficiently prepared for the next grade or course." Students rated "Advanced" – also known as Level III – are considered "well prepared for the next grade or course." Note that students rated "Advanced" are also considered "Satisfactory," and will be represented in both counts. To learn more about how the TEA defines its performance standards, click here. To use this interactive, select a school district from the drop-down menu to view its results. The sharp disparities on the latest scores of the state's standardized test at San Antonio's 16 school districts fit a clear pattern. Districts with higher percentages of poor households and English-language learners did worse on the State of Texas Assessment of Academic Readiness, or STAAR, taken last spring. Educators and parents here called the numbers sobering but unsurprising. Several said poverty is only a catchall explanation affecting a host of factors bearing on students' readiness to take the test. Northside's students did relatively well on the STAAR. It's a higher-income, suburban district, although 88 percent of students at Lewis' school are tagged “economically disadvantaged” by the state — eligible for free or reduced-price meals, in most cases because they fit federal poverty standards. Six miles away, in the heart of Edgewood ISD, poverty is a major roadblock to student success, said Pamela Reece, the principal at Roosevelt Elementary, a state “recognized” school. She recalled a kindergartener there who had to sleep in a car with his homeless mother. Area school superintendents are using the STAAR results to back their arguments for increased state funding, a rollback of the high-stakes provisions of the test and more rigor in their own school practices. 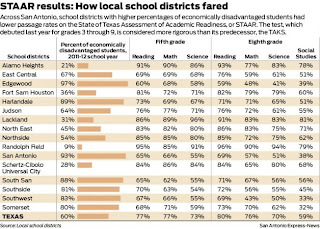 But the scores are significant for another reason — unlike Austin or Dallas, where one school district takes in most of the city, the many districts in and around San Antonio show student performance at a “granular level,” said Patricia López, a research associate at the Texas Center for Education Policy at the University of Texas at Austin. 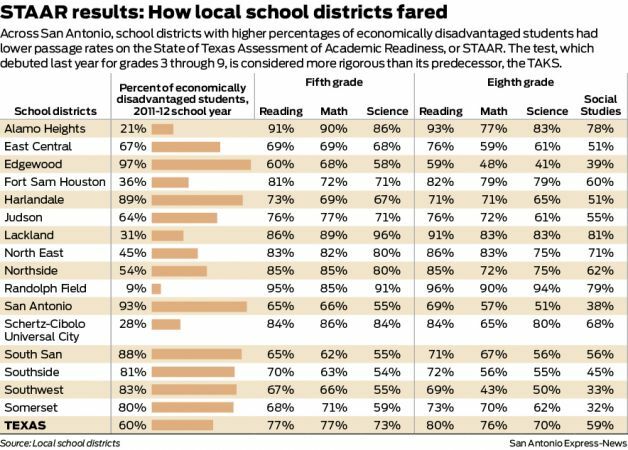 For example, passage rates for the eighth-grade social studies test — the lowest-scoring STAAR test statewide at 59 percent — are down in the 30s for four San Antonio districts with student poverty levels of more than 80 percent. Other statewide test averages showing passage rates in the high 60s and 70 can be similarly misleading, López said. But the San Antonio numbers do provide an idea — and the implications are stark. A state law requiring schools to hold back fifth- and eighth-graders if they fail the STAAR math or English language arts tests won't be enforced based on these latest scores — but will for the tests taken this spring, unless the Legislature changes it. The difference in those passage rates among local districts was as high as 47 percentage points, a San Antonio Express-News analysis found. Eighth-grade science scores had the widest spread among local districts, at 53 percentage points. Another trend is at work. The Hispanic population is increasing in both the state and nation faster than other groups — and it tends to be more economically disadvantaged, said Rice University Professor Steve Murdock, a former state demographer and U.S. census director. In other words, the population struggling the most with the STAAR is growing. The fate of minorities will predict how well Texas and subsequently the United States will do, he said. “And how well they do — the most critical factor is education,” Murdock said. Students in military districts like Lackland and Randolph Field ISDs and those in Alamo Heights ISD did the best on the STAAR. Only 8.6 percent of students at Randolph Field are considered economically disadvantaged, 21 percent at Alamo Heights and 31 percent at Lackland. The state average is 60 percent. Lackland Superintendent Burnie Roper said he was somewhat disappointed — more than 90 percent of his students typically pass standardized tests, but his fifth- and eighth-graders did that on only two tests this time. Military school districts don't collect property taxes, but federal and state funding lets them spend more per student than regular districts. Alamo Heights ISD is property wealthy — although part of that money goes to the state to be distributed among poorer districts, officials there are quick to point out. Roper thinks the notion that socio-economics determines outcomes is debatable, since several poor districts in Texas have done well on standardized tests. About 97 percent of Edgewood's 14,000 students are economically disadvantaged. That's no excuse for low scores but it does help explain them, Superintendent Jose Cervantes said. “This is exactly why we've been fighting in court, to get the same as other districts do because we need those resources in preparing our students and teachers for higher rigor,” he said. He created “war rooms” at every campus for educators to mull test scores and discuss how to improve them. Critics worry this is a prime example of “teaching to the test” but Cervantes said it produced steady progress on the benchmark tests students take to prepare for STAAR. Edgewood provided free school supplies this year to every student and has embraced the theory that it must work with parents to provide students better home lives so they come to school better prepared. Fast-growing Southwest ISD, with 83 percent of its students low-income, faces similar challenges. Superintendent Lloyd Verstuyft said administrators last year revamped curriculum to prepare for the test, but it will take time: “You have to get through the thorns to get to the rose,” he said. Verstuyft pointed out that Texas lets school districts decide if eighth-graders in high school math classes can choose to be tested at that level — which makes comparisons of eighth-grade math test scores unfair. Ted Guerra's two daughters attend the Young Women's Leadership Academy in the San Antonio ISD. It excels academically, though 73 percent of its students are considered low-income. Guerra thinks even poorer school districts can be dynamic, but he said it's easy to see differences in resources affecting local scores. Wealthier districts can afford reading specialists and other auxiliary positions that help boost performance, and teachers migrate to districts offering better pay — “Just like we have to feed our families, they have to feed theirs,” Guerra said. Northside, North East and Alamo Heights have higher starting teacher salaries than SAISD. Low incomes don't determine failure, but they surely stack the cards, Nancy Gunter came to realize. She taught at Jackson-Keller Elementary School in Castle Hills, a North East ISD campus with a 93 percent low-income enrollment. Many of her students were behind. A fourth-grader, she remembers, couldn't identify a triangle. Parents juggling two jobs don't always have the time to prepare their kids, and when all but a handful are behind grade level, it's harder to get a class caught up, Gunter said. An Alamo Heights ISD parent now, she thinks the perception that that district “is all white and it's all affluent” is too simplistic. Her daughter Claire will have to pass STAAR fifth-grade tests this year to advance to middle school. Some perspective is needed on the latest test results, warned Alamo Heights Superintendent Kevin Brown, a vocal opponent of high-stakes testing. The Texas Education Agency is expected to announce a new accountability rating system for schools and districts next month. The current system has relied heavily on test scores. State lawmakers also have vowed sweeping reforms to testing and accountability, although key Republican leaders have made no similar promises to expand school funding. The STAAR debuted only last year. Cervantes, the Edgewood superintendent, said it's somewhat unfair for districts to be judged harshly on scores that took almost a year to be released. Northside ISD Superintendent Brian Woods agrees. “If we had gotten these scores last summer, this whole school year we could have been better targeting what's working and what's not,” Woods said. Northside's percentage of economically disadvantaged students is nearly half of Edgewood's, as is its percentage of English language learners. There is no single way to raise test scores, both Woods and Lackand's Roper stressed. “If you went to talk to a fifth-grader or eighth-grader ... when you ask what they are learning, they are likely more to talk about their relationships with adults, their peers, athletics and what's fun about school,” Woods said. “Sadly, state tests could never convey that. These aren't college applications. They're applications for seats at charter schools. "I didn't get the sense that was what charter schools were all about - we'll pick the students who are the most motivated? Who are going to make our test scores look good?" said Michelle Newman, whose 8-year-old son lost his seat in an Ohio charter school last fall after he did poorly on an admissions test. "It left a bad taste in my mouth." Set up as alternatives to traditional public schools, charter schools typically operate under private management and often boast small class sizes, innovative teaching styles or a particular academic focus. They're booming: There are now more than 6,000 in the United States, up from 2,500 a decade ago, educating a record 2.3 million children. Charter advocates say it's a fair fight because both types of schools are free and open to all. "That's a bedrock principle of our movement," said Jed Wallace, president of the California Charter Schools Association. And indeed, many states require charter schools to award seats by random lottery. But as Reuters has found, it's not that simple. Thousands of charter schools don't provide subsidized lunches, putting them out of reach for families in poverty. Hundreds mandate that parents spend hours doing "volunteer" work for the school or risk losing their child's seat. In one extreme example the Cambridge Lakes Charter School in Pingree Grove, Illinois, mandates that each student's family invest in the company that built the school - a practice the state said it would investigate after inquiries from Reuters. When: Tuesday, February 19 at 10:00 a.m.
(AUSTIN, Texas) – Members of the newly-formed Latino Coalition for Educational Equality including MALDEF, HOPE (Hispanics Organized for Political Education), TABE, TACHE, Texas LULAC, MASBA, SVREP and the Latino Policy Coalition will present education policy reforms aimed at improving the quality of education for all Texas students, especially those that are low-income, English Language Learners, and attending under-resourced schools. Throughout the day, members of the coalition, as well academic experts advising the coalition will be presenting testimony at both the House and Senate Education Committee Hearings related to school accountability, student assessments and graduation requirements. “We can no longer continue the culture of high stakes testing and under-resourced schools. It’s time the Texas Legislature take meaningful steps to improve the quality of education for all Texas students,” stated David Hinojosa,Regional Counsel for MALDEF and lead attorney for the Edgewood plaintiffs in the latest school finance case, Edgewood ISD v. Williams. Founded in 1968, MALDEF is the nation’s leading Latino legal civil rights organization. Often described as the “law firm of the Latino community,” MALDEF promotes social change through advocacy, communications, community education, and litigation in the areas of education, employment, immigrant rights, and political access. 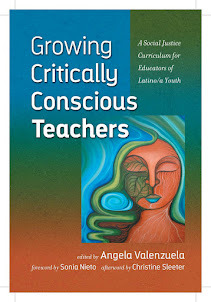 For more information on MALDEF, please visit: www.maldef.org.